In period the Lotus-Renault 98T was a formidable race car, competing at the height of Formula 1’s Turbo Era with huge power outputs and relatively primitive aero-dynamics compared to modern machinery, the 98T achieved 8 pole positions and 2 wins in the hands of the legendary Ayrton Senna and took Team Lotus to third in the constructors championship. 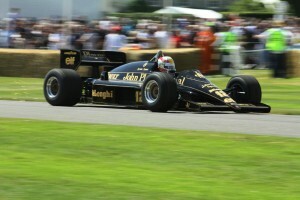 Although its racing career ended almost 27 years ago the 98T came back to the motoring worlds attention after the Classic Team Lotus run and Paul Morgan owned Chassis #4, used by Senna for the latter part of the 1986 season, came to an abrupt and expensive halt at Molcomb Corner whilst being driven by Gary Ward at the weekends Goodwood Festival of Speed. Type 98T chassis #3 is the most successful ex-Ayrton Senna grand prix car in private hands and now belongs to Zak Brown. Brown is a famous motor sports marketing guru, and the man whom many have tipped to succeed Bernie Ecclestone as the chieftain of Formula One. He generously gave up a few minutes of his time to talk to about this amazing piece of Lotus racing history. “Like so many, Senna was my hero so this car – and in that livery – I just had to have it, it’s so iconic! I think it will prove to have good long-term investment potential, though I’d never sell it.” That’s good news for marque enthusiasts as Brown remains committed to seeing his cars driven. “I bought the car two years ago, the previous owner had kept it hidden from the public eye” he reveals, “but I want the public to see it out. The car has just come over to the States and I’m going to run it at Mont Tremblant in Canada and then at Laguna Seca as part of Monterey week before it returns to Europe.” Once back in Europe it will run at Paul Ricard, along with the rest of Brown’s impressive fleet – with the help of a few friends. Brown is modest about his own driving abilities and it’s clear that he is awe of Senna’s talent and ability to get the most from such a demanding racing car. It was a treat for spectators when he handed the car over to 8-time Le Mans winner and former Marussia F1 driver Jerome d’Ambrosio at the 2012 Goodwood Festival of Speed. Kristensen in particular delivered utterly committed passes of the hill with those trademark sparks flying from the undertray. The 98T remains one of the ultimate, and most iconic, cars of a crazy generation. To own one is a phenomenal privilege, and it’s comforting to know chassis #3 is now in the hands of an owner with a genuine passion for the car and allowing as many people as possible to see it in action and savour the lunacy of one of Lotus’s finest achievements.